What a joke – again shows main qualification is being great and good rather than knowing something about the subject. No energy experts, one architect, one economist that’s it. No former members of the former Infrastructure Planning Commission for example, despite its huge expertise. Its not like every other zoning and subdivision system in the world which except in small states and island nations is a municipal level enabling power enabling the planning authority to zone for a use or mix of uses. No it would be a national development order listing the ‘qualifying documents’ such as local plans and brownfield site lists. Once the qualifying document is adopted etc. permission in principle is granted then the technical details consent (same as reserved matters) are dealt with. However the parallel with outline/reserved matters only goes so far. A typical outline consent allows for a mix of land uses or increasingly a mix within an agreed range. A local plan might set down policies for that range or it might not. This is where it gets messy. Lets say a local plan allocates a site for housing and retail with the intention that the retail is a local parade, but doesn’t set a maximum floorspace or percentage. As I read the bill there is nothing to stop permission in principle being granted to a mall on that site with a few houses. This is why it is essential that local plans are very clear on the maximum and minimum range for allowable uses. If they are not the permission in principle applies to the lot. It would be better I think to include mix within the technical details consent for a transitional period to prevent every single local plan having to be rewritten to be clearer. Of course the national development order might apply only to housing, but then the local retail, employment, community facilities etc. may never be built – some form of transitional arrangement seems essential otherwise there will be judicial challenges as to whether housing only would be what the local plan intended. The answer to this is in the impact statement. We expect it will take time for full implementation to occur, as brownfield registers do not currently exist and the measure will apply to site allocations in future plans and not retrospectively. However the total number of developments annually that could benefit from permission in principle will grow as plans and registers come on stream and make site allocations. This may be the intention but that is not what it says on the face of the bill. Unless the development order specifically lists plans in draft rather than every local authority – a rather unwieldy development order. Even so draft plans will need to be reviewed in order to make them clear and where necessary undertake consultation. A study worth £512,000 will explore options into the potential for creating a dedicated road link between Oxford, Milton Keynes and Cambridge. Highways England has appointed WSP Parsons Brinckerhoff, Halcrow and Steer Davies Gleave as a joint venture to lead the study. The study will consider options for improving connectivity between the towns and cities along from Oxford to Cambridge. It will also extend to the A34 as far as the M4. In particular, it will look at making use of existing roads where possible and considering the case for filling the missing links. The strategic study, which is part of the government’s Road Investment Strategy, has been commissioned by the Department for Transport. It is one of six studies taking place across England which are designed to address the biggest challenges facing the strategic road network. The study consultants will review existing evidence and prepare a case to consider improving the links between Oxford and Cambridge. The study will look at some of the fastest growing towns in the area, housing growth and how improving the infrastructure can support the growth of these towns, bringing wider economic benefits. Roads are key to our nation’s prosperity. For too long they have suffered from under investment. That is why as part of our long-term economic plan we are investing a record £15 billion in our roads programme. Improved road links between Oxford and Cambridge will allow hardworking families to have better access to jobs, shops and leisure facilities. This study could lead to major benefits across the UK and I’m pleased we’ve now reached the stage where we can appoint specialist companies to start the study process. The Oxford to Cambridge Expressway is about improving the transport network. An expressway could be created through improving the existing road network, however we have some gaps, particularly between the M1 at Milton Keynes and the M40 near Oxford. It will also assess where the slow speeds and delays are currently being experienced and study the housing growth in the area which will subsequently increase traffic congestion. The study is due to be completed by Autumn 2016.
development of a prescribed description. The application route (part B) has no requirement for a ‘qualifying document’ such as a plan or register. The explanatory notes say it is for small sites (less than 10 units) only, but that is not on the face of the bill it is secondary legislation. It makes sense to have a provision for small builders and small unidentified sites. However many commentators seem to have missed that clause (a) is for big sites and so have underestimated the scope of the Bill. Micheal Pettis has a a long and interesting post which is effectively a critique of Steve Keen. The reference being to Steves formula Investment = Savings + change debt which appears to violate the S=I Keynes identity to which Pettis holds to. Certainly Pettis is on the right track in criticising the ‘thin air’language (from Schumpeter) which implies a spooky costless and causeless economy which could grow by itself forever. A constant theme on this blog has been that whilst money creation is ex nihilio money is not created out of thin air. Like everything else it is limited by economic laws, in this case the general equation of accounting- which means that liabilities must in all cases be backed. However in the entire post Pettis does not refer to temporal changes, economic growth, and how this governs the accounting relationships between the real and monetary economies. Hence in a model based on such assumptions nothing can ever change if all accounting identities are at unity. In creating the S=I identity Keynes was seeking a way of avoiding the complications of capital and monetary theory. In effect the general theory was an ít doesnt matter’theory in that what ever went on under the hood the Kaldor multiplier would ensure that incomes (& savings) were driven by investment. All well and good but it obscures us to important issues, such as the credit cycle, that drive changes in investment. This is the trap I think Pettis has fallen into. I’ll present below a structure I think helps in explaining what happens between money creation and investment, correctly mathematically formulated it allows us to construct a model with intersecting balance sheet identities, that is stock and flow consistent, and has dynamic change. Imagine we are modelling the shortest possible duration of economic time between a decision to invest and its spending. That money can come from one of three sources, either from idle balances, from state money creation or from bank credit creation. If we go to the limit of continuous time there will always be a period of idle balances between one of the two originary points of money creation – state or bank, and all idle balances can be tracked back to the point of origination. This point between creation and spending – to a balance – to respending – can be traced through a Taylor series into a geometrical contraction so that the additional effective demand from the money creation declines over time so there are no idle balances left either in the original account or in all subsequent accounts into which the balances are transferred. 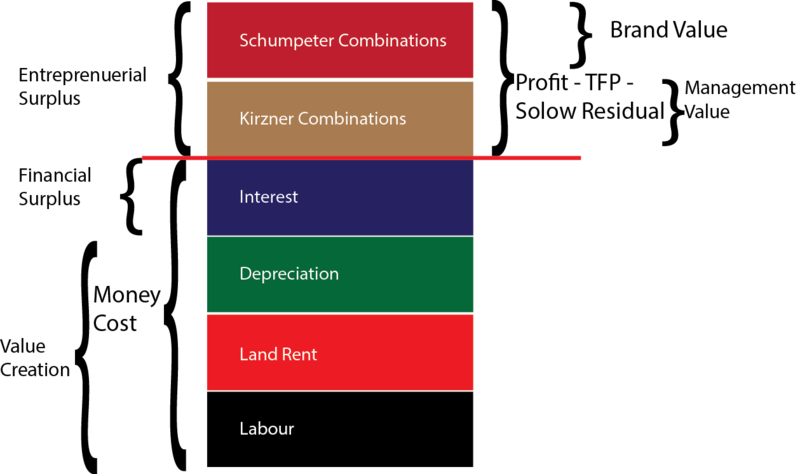 This is precisely the multiplier mechanism sketched out by Keynes and Kahn. It is this process that generates the Samuelson-Hansen (1949) Multiplier- Accelerator model. The re-spending of the generated money creates a multiplier effect and the additional incomes generates an investment accelerator effect. In the Samuelson-Hansen model though their is no inventories and no stocks, the sequence analysis approach is lacking. We can correct this. Consider bank credit creation. The creation of a liability must be backed by equity (or debt) to avoid a cash flow issue. The banks first call will be to balances on hand (included invested equity and retained profits) before using the clearing process and seeking debt – a consequence of the general equation of accounting. You can refer to some of my other posts for this set out in detail in T accounts, however if the bank has to obtain funding this always has a cost, it either has to transfer existing balances (including where additional cap[ital is sought) or resort to debt. Again the money must trace back to a source, other banks or state money creation. There is a problem with relaying wholly on other banks, whilst an individual bank can expand its balance sheet as much as it can be funded the banking system as a whole is constrained unless there is a central bank. This is the Davidson/Phillips formula – which is another example of this geometrical contraction- the expansion of lending must be funded from real balances or lending and the balance sheets it toto cannot expand from banks lending to each other. Ultimately the capacity for credit to expand across the economy as a whole is dependent of state money creation. No-one rationally invests unless there is an increase in surplus which the render takes a share of profits from to fund interest. The ability of the economy as a whole to invest is constrained, either by the ability to postpone current consumption (Crusoe like saving) for future consumption – or – and this is the omission made by Adam Smith and the Austrians, to take the risk of losing future consumption without investment for the potentially higher returns of future consumption with it. However the limit of potential investment is the Net Present Value of future investment. If this is higher then what can be funded by present account balances then the gap MUST be made up through state money creation. Austerity therefore reduces future potential incomes. Pettis is in effect relying on the Says Identity – S=I where S is unspent balances, without allowing for the fallacy in Says Law, that planned savings and planned investments adjust with a variable time lag and may not be realised. One could extend this further by looking at this from a capital theory perspective and the natural rate of interest, and bring in factor returns – but I hope you get the idea. The UK spends almost 10 times as much as Germany on housing benefit but could slash the bill by adopting a law used in that country, which freezes land values at the moment they are earmarked for residential construction, according to a think-tank. Some 1.4 per cent of UK GDP is spent on subsidising housing costs, compared with 0.81 per cent in France and 0.14 per cent in Germany, according to the centre-left think-tank Policy Network, which is chaired by the former Labour business secretary Lord Mandelson. The group is urging George Osborne, the chancellor, to consider reshaping the UK housing market through land reforms, bringing the country closer to Germany’s model. “It is clear that Britain’s broken housing market needs to be fundamentally reformed if construction rates are to jump and the redistribution of taxes for housing benefit due to excessively high rents is to fall,” said Thomas Aubrey, the report’s author. The proportion of UK GDP spent on housing benefit has increased steadily from just over 1 per cent in 2005, the figures show. British construction rates have also been lower than those in five comparable European countries — France, the Netherlands, Germany, Denmark and Sweden — based on official data from each country. Between 1975 and 2014, the UK completed 3.5 new homes per 1,000 people each year, compared with six in France and 4.6 in Germany. In recent years, between 2010 and 2014, the UK was again the slowest builder, constructing 2.2 new dwellings per 1,000 people each year, the report finds. With the costs of home ownership increasingly out of reach — the average home in London costs 10 times the average salary — growing numbers of people remain tenants, pushing up rents. That in turn has more than doubled the government’s annual housing benefit bill since 1996 to £24.2bn. Ministers are attempting to address the housing crisis through a series of measures, including overruling councils that are reluctant to build homes and introducing a legal duty for councils to build “starter homes” to sell below market prices. These are included in a housing bill published this month. Separately, Mr Osborne has capped total state benefits available to households. He blames the practice of “land banking”, in which landowners may hold land without developing it, watching its value rise once planning consent is granted. Some countries, such as Denmark, have tackled this through versions of a land value tax, based on location values, aimed at bringing idle land into use. But in Germany, planning law freezes the value of land once it has been earmarked for residential construction. This is Mr Aubrey’s preferred option. Policy Network suggests regional authorities should be able to acquire land at “close to use value” in dedicated housing zones, through an amendment to the 1961 Land Compensation Act, which deals with compulsory land purchases. James Pargeter, head of residential projects at Deloitte Real Estate, said housebuilders and developers were restricted by the need to borrow money to finance developments. “It’s not usually a problem of developers not wanting to get on with it. They are working under conditions set during the downturn by their banks and funders,” he said. Housing availability could benefit from more emphasis among planners on the “build-to-rent” sector, he added. Mr Aubrey, however, believes the Conservative government may be open to more radical land reforms. Mr Osborne cut tax relief for buy-to-let landlords in this summer’s budget — a move for which Policy Network had lobbied. “[George Osborne] has shown he is willing to put his neck on the line for policies he thinks will help to make the economy more productive,” Mr Aubrey said. Is Zoning System of Housing Bill a ‘Nail in the Coffin’ for Good Design? This week looks set to see the unleashing of a new drive to increase England’s historically low levels of housebuilding with the publication of a Housing Bill. Much of the attention has been focused on David Cameron’s Conservative party conference pledge to exempt developers from having to supply social rented housing. However a so-far relatively little-debated change to planning law, set to be included in the bill, could make it much harder to police design quality through the planning system. The proposed change was initially outlined in the government’s economic productivity plan, entitled Fixing the Foundations, which was published during the summer. This stated that automatic planning permission could be given for “suitable” sites included in a register of brownfield land. In effect, this would result in the partial introduction of a US-style zoning system, where development is granted in principle. While the UK has forward plans that allocate sites for particular types of development, actual permission rests on a planning decision, usually made by a local authority. The productivity plan states that this existing, discretionary system leads to a “slow, expensive and uncertain process”. Planning minister Brandon Lewis told a meeting of the House of Commons communities and local government (CLG) select committee last month that the move was designed to boost the ability of developers, particularly small and medium-sized builders, to raise finance. However the government’s proposal has sparked fears that councils’ albeit oft-criticised ability to influence design quality will be further hamstrung. “We are pleased that the government has recognised the importance of getting houses built,” says Andrew Forth, policy and public affairs manager at the RIBA, pointing out that the institute has backed the construction of 250,000 homes a year. However he is concerned that there is a “lack of clarity” from the DCLG about how the new system will work. Forth worries that the initiative may see a repeat of the problems that have bedevilled the recently introduced permitted development rights regime for office-to-housing conversions. The capital’s local government umbrella body London Councils published a report in August highlighting the sub-standard housing conditions that the new fast-track regime has delivered. In Croydon, where there has been a rash of office-to-residential conversions under the new rules, it says that “almost none” of the approximately 1,700 homes created have any private or communal amenity space. The report voices similar concerns about the conversion of Islington’s Archway Tower. “The nature of the homes that have been delivered has been very poor quality,” says Forth. Richard Blythe, head of policy at the Royal Town Planning Institute, says a lot will hang on the government’s definition of what is a “suitable” brownfield site, on which topic Lewis was vague when he appeared before the select committee. The RTPI has expressed concerns that much brownfield land is unsuitable because it is in remote locations. And even if the land is suitable in principle for building on, this doesn’t mean the scale of development will be. For Hugh Ellis, head of policy at the Town and Country Planning Association, the acid test is how much detail will be reserved for the second and more detailed stage of the process. He argues that design is key to the principle of whether a development should be granted permission or not. “The principle of development is related to whether or not it is good design,” he says. Hank Dittmar, the US-born former chief executive of The Prince’s Foundation, and a BD columnist, says his country’s zoning system was introduced in the 1920s as part of a movement to separate housing from noxious industrial uses, which in this country led to the system of use class orders. The zoning system has helped to create the bland, monocultural suburban environments which have become such a hallmark of US cities. Dittmar believes that zoning can play a “limited role”, such as on brownfield sites where councils have failed to put forward a local plan. However, he warns about the “danger” that a wider roll-out of the zones will result in grassroots democracy being bypassed with a knock-on impact on the quality of design and a watering down of local character. Anyway, he points out, the need to obtain other environmental and building regulation permits means that zoning doesn’t save much time. Lewis told MPs that even though permission might be granted in principle, councils would still be able to control the detailed aspects, such as design, via negotiation with the developer. But this is too late in the process, counters Ellis. “When something is agreed in principle it becomes almost impossible to oppose on issues of design,” he says. At the very least, he believes the government should have consulted on such a momentous change, such as by publishing a white paper, before moving to legislate. “If we are going to move to a US system we need more of a public debate,” says Ellis. Given the pace that the government is moving on planning reform, that debate will need to start quickly. Are they right? Only to a point. None of the above commentators seem to have read the Housing and Planning bill itself which makes clear the technical details are the same as reserved matters on an outline planning consent. What this means is that ‘permission in principle’ is the same as allocating a site for uses and an amount of development and then granting outline planning permission with all matters reserved for this. Does this lead to a diminution of good design with schemes of small units and no amenity space for example like PD office conversions? Well that depends totally on the work the LPA and/or the developer has done before that consent. If the application is for a certain quantum of development they need to be sure that it will fit within certain zoning parameters, that there will be the roads and open space and public services and infrastructure capacity. Ideally this is done through a design, an illustrative masterplan. On uncomplicated sites, or if you lack resources or are just plain lazy you can apply certain norms such as an .exaction rate’ (such as 35%) for the proportion of the site used for roads, public services, technical plots and open space, and then apply a rule of thumb such as FAR (floorspace area ratio) for the built up area permitted for the land remaining. The trouble is when you dont design you get the risk of monculture of uses and monotony of form. A proper masterplan will plan for a mix of uses and variety of forms and then rules and parameters per superblock and then parcel to ensure these are delivered on the ground. None of this is precluded by a zoning and subdivision system. Indeed next month I shall be taking a study party of a client around many sites in Germant, Denmark and the Netherlands where outstanding urban forms have been developed by this method. The real risk of the Housing and Planning Bill of a lack of resources for design, good masterplanning and form based zoning to go with it, which make a zoning and subdivision system work. In this post ill look at one key aspect of the recently published Housing and Planning Bill 2015-2016 – the single stage permission concept, rather than every planning related clause. But is this what the face of the Bill proposes? No section 102 ‘Permission in principle for development of land’ has no restriction to brownfield land, a policy distinction not a legal one’ let alone to land on a register. This is a political ploy, the power enables permission in principle to be granted for any land including Greenfield sites. Note that land can qualify either through being allocated in a development plan (including a neighbourhood plan) – and this can include greenfield sites – or through being in a qualifying document which allocates the land. However under current legislation only a development plan can allocate land. The 1990 act is clear about that. This is where the new section 14A (tpo the 2004 act) comes in setting up registers of qualifying land. This restricts an LPA granting permission in principle to site contrary to the development plan. The enabling clause however simply enables them to set up the register. I have doubts whether by itself it enables them to allocate land in a development plan when the plan itself is silent about the future use of the land – as most plans are on brownfield sites. That would require much more fundamental revision of the 1990 act. Schedule 6 has a number of minor and consequential amendments makes many changes to the 1990 act, nut these simply add ‘or permission in principle’ to the many development management and compensation clauses. The local development documents must (taken as a whole) set out the authority’s policies (however expressed) relating to the development and use of land in their area. It is an open and debatable question whether the Housing and Planning Bill is sufficient to enable allocation of land. So far as an LPA allocates qualifying land allocated within a development plan they will be safe from SEA, consultation duty etc. challenges. If it is not however they run major risks. Surprisingly their is no restrictive clauses on allocation of land covered by the habitats directive, as their is with local development orders. This is a major lacuna. It cant simply be assumed this is covered by a plan allocation that may or may not exist. I hope this gap is plugged at report stage. There also seems to be a gap in relation to EIA, though this can simply be plugged by amending secondary legislation. There is also a clause 104 allowing conditions to be granted to development orders for development and not just change of use. This is crucial and will also make LDOs much simpler. You will no longer for example have to specify every last thing, such as building height, in a scheme. This is a key lesson from zoning and subdivision schemes abroad where conditional consent on rezoning is a key tool. Further study is needed on whether the consequential provisions fully cover S106, CIL etc. If not LPAs can simply go down the clause (b) application route and applicants can submit applications with unilateral undertakings, duplicating the ‘rezoning by contract’procedure in zoning and subdivision jurisdictions. The final step once permission in principle is granted is approval of ”technical details consent” whis is exactly the same as reserved matters. A reall opportuinity for reform has been missed here. It could have been used to fully duplicate a zoning and subdivision based system, by for example use of terms such as ‘road layout, ‘plot subdivision’, ínfrastructure networks’, ‘General Form and Development Bulk’, ‘General Landscape Structure’and ‘Detailed buildings design’ and ‘detailed landscape design’. The current reserved matters dont really easily relate to the stages a masterplan goes through and dont lend themselves to granting of ‘masterplan consent’for a scheme at different stages, concept, schematic and detailed. Overall the section is a bit of a half way house and has something of the back of a fag packed nature of many of the parts of the bill, not yet fully implementing the revolution in planning it portends. If we are moving to a zoning and subdivision system this requires checks and balences for when zoning becomes rezoning, so their is a proper public heating, democratic decision and independent review. There is nothing in the bill at present to stop any cabinet member with delegated authority to add a piece of unzoned land to a register and then grant it permission. Without such checks and balences international experience shows that zoning and subdivision systems can be very open to abuse, favoritism and graft. This week South Oxfordshire published a Green Belt review by Terra Firma, this is despite a county wide study being commissioned from LUC on behalf of all Oxfordshire authorities. What a joke – the study is clearly an attempt to preempt the county wide study and being partial cannot hope to weight up whether the weight of housing need meets the ‘very special circumstances’ test. One place only for the study – the bin -till the proper study arrives. What a waste of tax payers money and time.